The exact details of the agreement seem unclear. The union is clearly attempting to make it look like a victory. However, the pay offers still remain below inflation and so constitute real terms pay cuts or civil servants. Furthermore, the deal trades off "efficiency savings" (so cuts) with potential pay deals for remaining workers and so will divide the workforce against itself. There is also no sign of concessions on the union's other aim of decoupling the cost of progression from pay. 200,000 civil servants in benefit offices, job centres, the coastguard and elsewhere were due to strike for 24 hours on 10 November, but the action was called off pending talks just after the NUT announced that it would not be calling further teachers strikes. 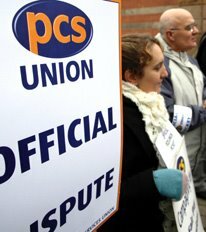 The PCS announcement marks another blow against workers attempting to defend themselves from attacks on their standard of living.